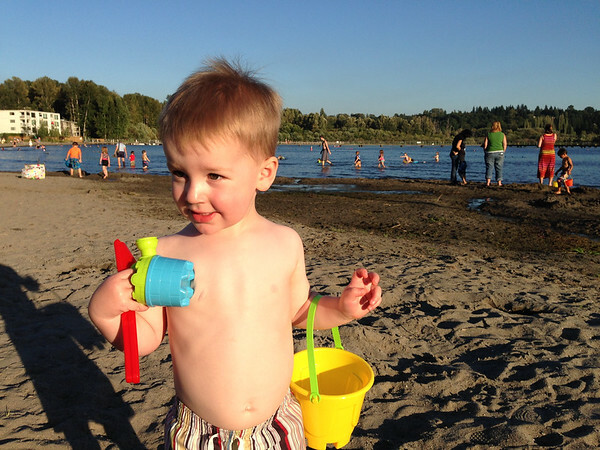 A few weeks back we had a case of the grunts. That is when you ask Cooper a question he just makes a noise instead of saying yes or no. We have been working hard and had great success now hearing a yes or no for our questions. The way he says “yes” is adorable. Today the “yes” turned into “um, sure” and we have a feeling this expression is here for the long haul. 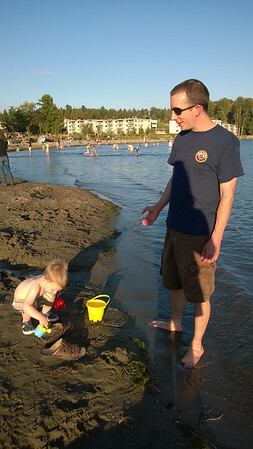 Cooper took advantage of the nice weather and beach birthday party to water Daddy’s shoes. This weekend Cooper and Daddy tackled the grocery shopping while Nicholas and Mama finished up at Target. Apparently when they were shopping and turned the corner Cooper’s eye lit up and he loudly said “aggs” as they passed the egg display. Rob said other shoppers in the area gave a big smile to hear him say it so loudly and proudly and just like how his Mama says it. Looks like he needs to spend some more time with Daddy if we are going to have aggs corrected to eggs. Cooper and Nicholas have been very excited to have super friend time these past couple of days. 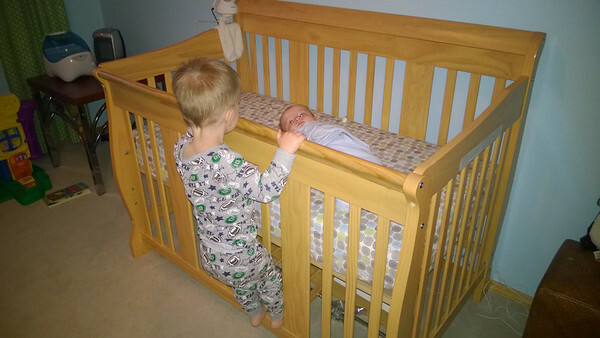 Madeleine’s little brother has been sending mixed signals on when exactly he wants to arrive. Above the kids were practicing for their upcoming slumber party. 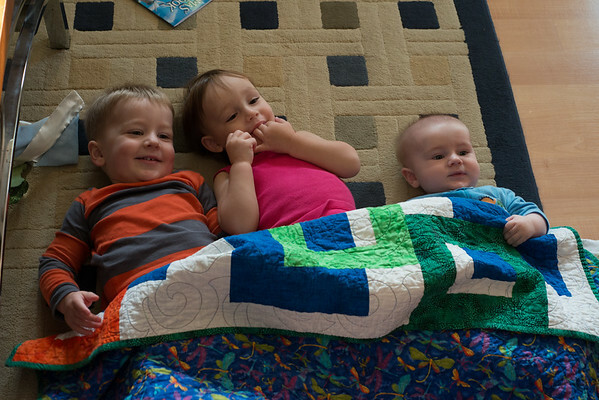 One day these crazy kids could have a slumber party on the floor together, but for now we are sticking with cribs in separate rooms. 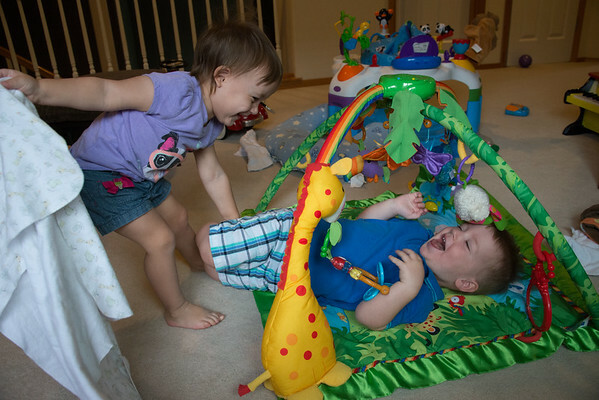 This pictures sums up just how much fun Madeleine and Cooper had. They were putting each other to “bed” using the blanket to cover the other one up. I loved watching their creativity when playing together. 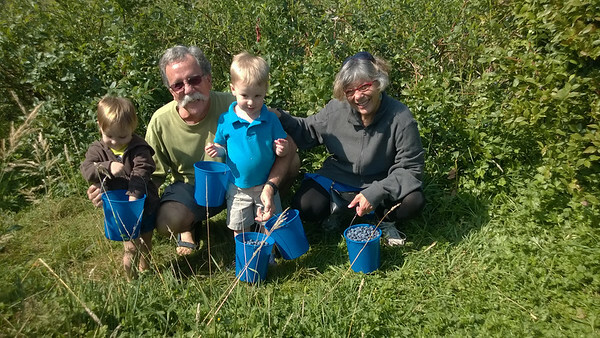 Grandpa and Grandma came over one morning to help cart everyone to the blueberry farm for a picking adventure. While out in the fields I opted to feed Nicholas in the carrier instead of heading back to the car and it went surprisingly well. Nicholas is really turning into a “go with the flow” kind of kid and we are loving it! 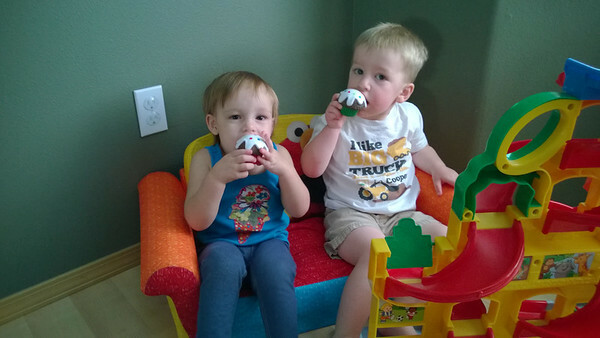 These new play cupcakes came in very handy to help us celebrate baby Elliott’s birthday. It is always a great way to start the day with these two boys so excited to see each other.